As he is the head of the Kuchiki family, he wears the same scarf that Byakuya wears now. He, however, does not wear the aristocratic hair piece that Byakuya does. It is possible that he was one of the first Captains in the Gotei 13 because during the Turn Back the Pendulum Miniseries, he is shown as one of the 13 Captains and looks like Captain Yamamoto does now (facial features, signifying their age). 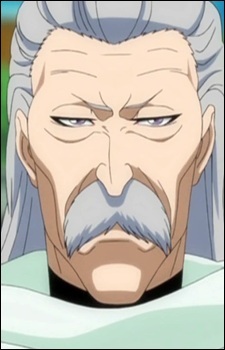 This is unlikely, though, since it is also mentioned that the only old captains left are Shigekuni Yamamoto-Genryūsai, Retsu Unohana, Jūshirō Ukitake, and Shunsui Kyōraku. During the Turn Back the Pendulum Miniseries, he is also shown introducing the current 2nd Division Captain back then, Yoruichi Shihōin, to Byakuya, who was training at the time. He also appears to be exasperated by Byakuya's rash and hot-headed nature, mentioning that he'd be a great leader if only he'd learn to control himself, as he does in later years. It is not known whether or not if he is alive at the present storyline.